On several occasions in recent years, Donald Trump has expressed his opinion that global warming, or climate change, is a myth. He's called it an "expensive hoax" and "bulls**t" that was invented by the Chinese to hurt US manufacturing. "I don't believe in climate change," he said in a 2015 interview. The vast majority of scientists, with some exceptions, disagree. 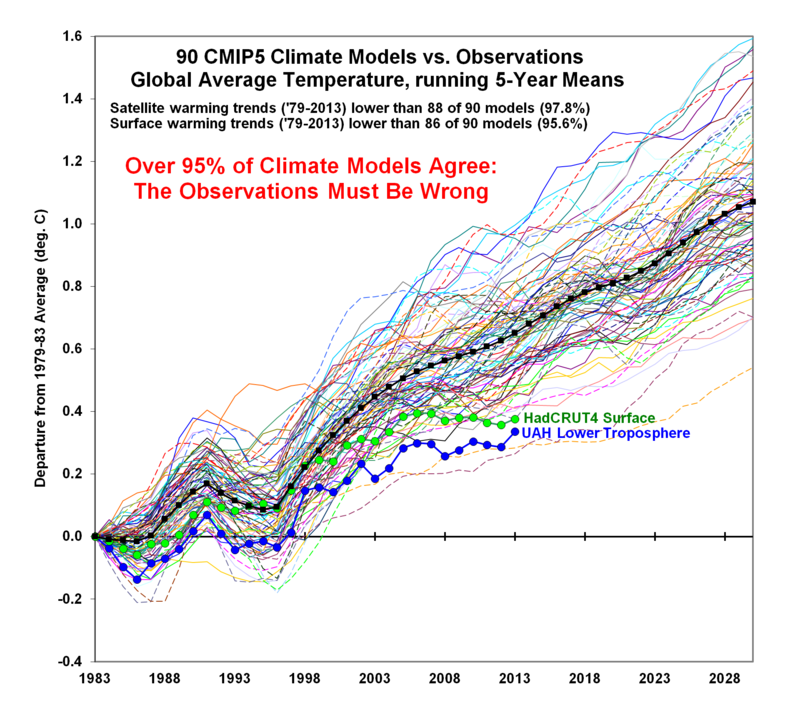 Having no expertise in this area, my strong inclination is to defer to the overwhelming scientific consensus -- even while acknowledging the dramatic shortcomings of alarmist modeling, as well as potent allegations of unethical methods and vengeful blackballing by some prominent climate scientists determined to silence critics. The evidence demonstrates that the earth's climate is warming over time, and that mankind is a driver of that change. I therefore reject Trump's denial of this reality, which is sometimes justified by unserious anecdotal observations. (1) Constitutionally speaking, Obama frequently sought to bypass Congress on big-ticket legacy items, largely because the American people saw fit to radically alter the balance of power in Republicans' favor over the course of his presidency. Voters looked at Obama's agenda and did what they could to send a clear message: Stop. The former president reacted by imposing sweeping regulations and entering and internationally-significant agreements without the consent of Congress. That governing approach has consequences, one of which played out yesterday. My preference would have been for Trump to submit Obama's agreement to the Senate as a treaty and let the process play itself out more democratically, almost certainly resulting in the agreement's lopsided demise. If the United States is going to bless a mortal enemy's previously-illegal nuclear program, or adopt a massive climate deal with sweeping economic and energy implications, such decisions should be made by consensus; not through reversible executive fiat. While legally binding, Kyoto’s CO 2 emissions targets weren’t strictly enforced. European countries that pursued aggressive reductions were engaging in economic masochism. According to a 2014 Manhattan Institute study, the average cost of residential electricity in 2012 was 12 cents per kilowatt hour in the U.S. but an average 26 cents in the European Union and 35 cents in Germany. The average price of electricity in the EU soared 55% from 2005 to 2013. Yet Germany’s emissions have increased in the last two years as more coal is burned to compensate for reduced nuclear energy and unreliable solar and wind power. Last year coal made up 40% of Germany’s power generation compared to 30% for renewables, while state subsidies to stabilize the electric grid have grown five-fold since 2012. But the climate believers tried again in Paris, this time with goals that are supposedly voluntary. China and India offered benchmarks pegged to GDP growth, which means they can continue their current energy plans. China won’t even begin reducing emissions until 2030 and in the next five years it will use more coal. President Obama, meanwhile, committed the U.S. to reducing emissions by between 26% and 28% below 2005 levels by 2025. This would require extreme changes in energy use. Even Mr. Obama’s bevy of anti-carbon regulations would get the U.S. to a mere 45% of its target. The Germans have jacked up energy costs on their people, yet emissions are increasing anyway (unlike in America, where fracking has partially helped to significantly reduce emissions in recent years). Regardless, even if one prefers to deny the economic science on growth and jobs, spiking energy prices are undeniable, black-and-white realities in Europe; Obama himself once candidly admitted that his preferred policies would cause related costs to "necessarily skyrocket" for consumers. This would be tantamount to a highly regressive energy tax, disproportionately impacting poor and working class families who are least able afford dramatically higher monthly bills. Dismissing these considerations is indefensible and callous; these policies, which were never agreed to by the branch of government most accountable to voters, would have real impact on real people. One of the biggest reasons Trump won is that he campaigned on a promise to put American workers and taxpayers first. His newly-announced decision adheres to that pledge. If we apply the EPA climate model under a set of assumptions that strongly exaggerate the effectiveness of international emissions reductions, the Paris emissions cuts, if achieved by 2030 and maintained fully on an international basis through 2100, would reduce temperatures by that year by 0.17 of a degree. The US contribution to that dubious achievement—the Obama climate action plan—would be 0.015 of a degree. The climate impact of all Paris INDC promises is minuscule: if we measure the impact of every nation fulfilling every promise by 2030, the total temperature reduction will be 0.048°C (0.086°F) by 2100. Even if we assume that these promises would be extended for another 70 years, there is still little impact: if every nation fulfills every promise by 2030, and continues to fulfill these promises faithfully until the end of the century, and there is no ‘CO2 leakage’ to non-committed nations, the entirety of the Paris promises will reduce temperature rises by just 0.17°C (0.306°F) by 2100. Does anyone believe that nations with emerging economies will comply with every single objective of this non-binding agreement, which lacks enforcement mechanisms -- even when they're facing economic pressures and hardships? Does anyone believe that the Chinese will rapidly shutter the hundreds of coal-fired power plants they're currently planning and actively building just as soon as some words on a piece of parchment signed many years earlier say that they "must"? It's not anti-science "denialism" to answer those questions skeptically. I'd actually argue that optimistic expectations on these questions are quite naive. Ultimately, in considering the Paris accord, the fundamental question is whether the trade-offs it demands are a good deal for the American people. The president doesn't believe so, and I tend to agree with him -- and the hysterical dissenting conniption fits from some quarters have done absolutely nothing to convince me otherwise.